Strait of Georgia separates the Vancouver Island from the Canadian state of British Columbia. It is a very small part of the great Pacific Ocean, to be precise North Eastern part of the Pacific. 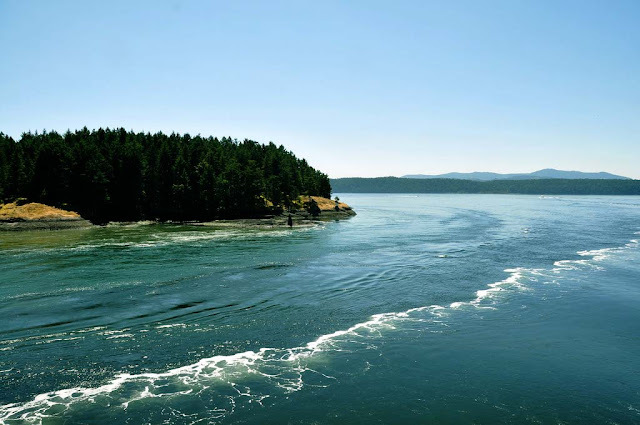 The strait is 138 mi long and its width varies from 11 to 34 mi. The strait is almost blocked by a group of islands in the north. A narrow passage named as “Discovery Passage” connects it to the “Johnstone Strait”. 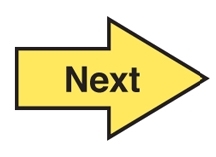 It is the northern route to go out from the Georgia Strait. If you want to enter into the Strait of Georgia from the south, head straight for the Strait of Juan de Fuca. 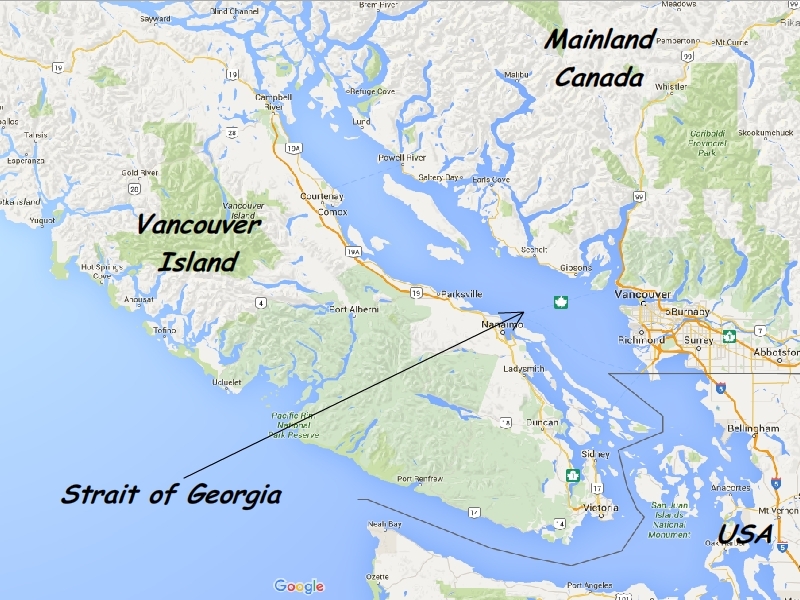 There are two islands which separates Juan de Fuca from Georgia strait: San Juan and Lopez. From here you can take any of the three channels or straits: Haro Strait, San Juan Channel, and Rosario Strait. Image Copyrights: All the images used in these article are taken from Public Domain. It is believed by the geologists that the Strait was originated 150 million years ago. After the retreat of the ice (around 14000 years ago), the area has gotten its modern shape. The average depth of the Strait of Georgia is 512 ft. The deepest part of the strait can drown a hill of 1400 ft. The total surface area is 2600 sq mi. The bay is flooded by the fresh waters of the Fresher river. It discharges average more than 120000 cu ft/s water. The highest discharge capacity of the river is about 600000 cu ft/s. That is why the salinity of the strait is quiet low. BC Ferries or British Columbia Ferries carries most of the passengers to and from various islands and the mainland. They are one of the world’s busiest public transport systems. 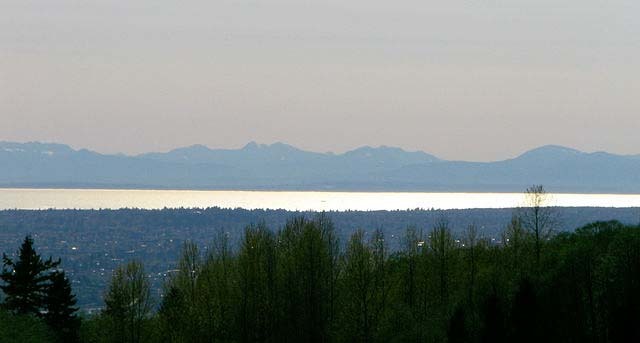 The Strait of Georgia, Puget Sound and the Strait of Juan de Fuca are together also known as the Salish Sea. The name came from the Salish people who live around the area for thousands of years. Previously, we have known that the Strait of Georgia has some islands choking its both entrances. Some of these are big like the Quadra, Texada, San Juan, Orcas, Galioano, Salt Spring, Lopez etc. 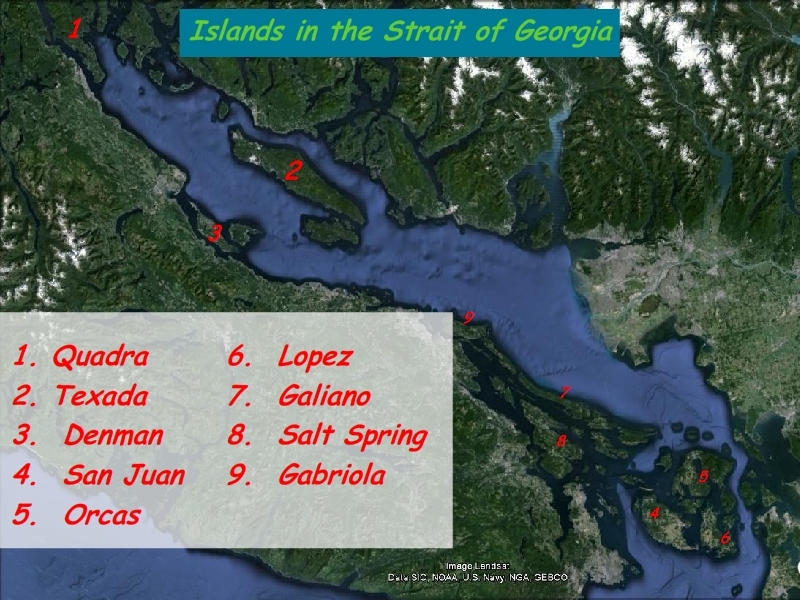 The island of SanJuan, Lopez, Orcas and a few smaller ones like Shaw Island, Decatur Island, and Blakely Island etc are grouped into San Juan Archipelago. It is situated near the south end of the Strait of Georgia. The Archipelago belongs to the United States of America. Quadra Island is of decent size. It comprises an area of 120 sq mi. The island is inhabited by some Indian tribes. There are close to 2500 people living here. Texada is a 31 mi long island. In its widest part, it is about 6 mi. It is 116 sq mi in land area. More than 1000 people lives here. Fresher is the largest river which joins with the Strait of Georgia or Salish Sea. The source of the river is the Rocky Mountains, particularly Mount Robson Provincial Park. The length of the river is 1651 mi. It forms a delta at its mouth on the Strait. Pitt is a subsidiary of Fresher which joins with later near its mouth. Its source is the Garibaldi ranges of the Coast Mountains. Two other important rivers of the area are Squamish River (length 50 mi) and Brem River. Due to the glacial and volcanic activities, the terrain of the Georgia Strait area is broken. So, the rivers have formed a number of lakes near the marine regions. Harrison Lake is the largest among all these lakes. It drowns about 95 sq mi of area. Alouette Lake, Stave Lake, Coquitlam, and Buntzen Lake are among other notables. A lot of tiny islands, numerous estuaries and small bays, hundreds of small streams, the existence of big Fresher River has contributed to make the region as an ecologically rich and biologically diverse area. About 3000 species of marine flora and fauna lives here. Most diversity can be found near the estuaries. We know that an estuary is the meeting place of a river with a sea. The river carries fresh water that gets mixed with the salt water of the sea. So, here one can find gradual increase of salinity and water density. These are the most supportive systems for biological diversity. The strait is famous for its whales. There are also many other sea mammals like seals, porpoises, sea lions etc. About 200 species of fish can be spotted here like sardines, mackerels, wild salmon etc. Thousands of various invertebrate sea animal species also live here. There are also more than 700 species of marine plants and sea weeds here. 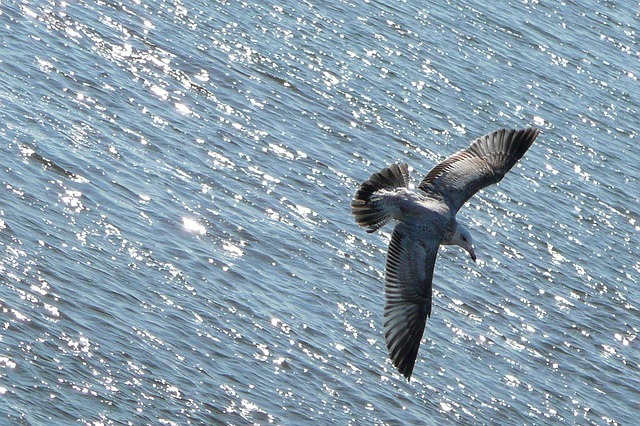 More than hundred species of sea and shore birds also add to the diversity of wildlife here. 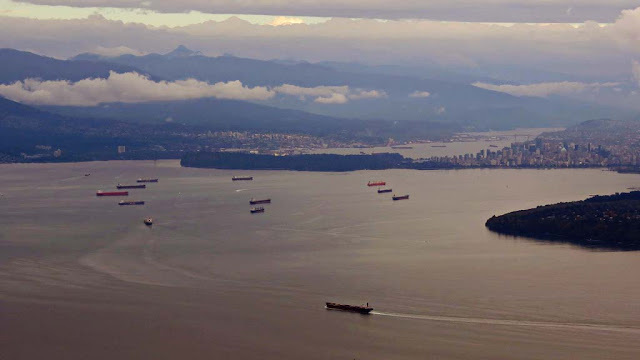 The existence of the port of Vancouver near the strait is the main driving force of the local economy. The port handles 135 million tonnes of cargo ever year. Thousands of people are depended directly or indirectly upon the port for their livelihoods. The Strait is tourist magnet. Thousands of tourists from Canada and USA come here every year. Bird watching and Whale watching are the main tourist attractions here. Water based sports like Scuba diving is also very popular. Shellfish farming and fishing is an important industry for local people here. Many such communities live around the Strait. Nature is under threat of being destroyed everywhere by us. The Strait of Georgia is no exception in this case. The diversity of life and the purity of its nature are losing fast. Rapid population increase around the area is the main reason of this ecological threat. The urbanization and development of the areas are causing harm to the nature and its inhabitants here. Growth of many industries around the region is another threat to the marine life here. These industries release toxic chemicals to the seas which results in death of thousands of sea animals. Moreover, global environmental problems like climate change, increase of global temperature, green house gases etc also affects harmfully to the local environment. Many people are working to save the nature and diversity of the region. People need to make aware about the problem. The area is rich in natural gas so an LNG industry is growing rapidly here. Excavation of natural gas and the factories to refine it may cause havoc to the natural environment of the area. Due to the harmful combined effects of the above mentioned issued, 119 species of marine animal of the strait area are at risk today. The number is growing every day. If the government and the industries ignore the matter, some of these valuable natural assets will be lost forever.